This Coway Air Purifier is pretty cool. 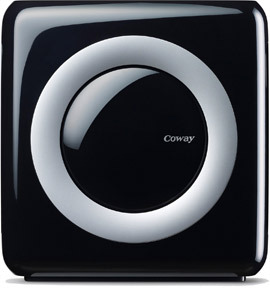 Many air purifiers today are more like computer towers, but the Coway is a bit of a box, and it has great design. It boasts 5 speeds and you can add the ionizer at any setting. The low speeds are dead silent, and the high speeds do produce an audible noise and turn up te air flow quite noticeably. It has an ECO setting and an AUTO setting, which are similar, and modify the fan speed in relation to what the unit detects in the air. In ECO mode, the unit will shut down if it is happy with your air quality over a 30 minute period (but on AUTO mode it will not stop). If you wanted an ionizer you could trust, this is one. You will notice the difference. It will be visible because there will be dust everywhere, which will not be in your lungs, and which you can easily sweep up. Depending on the air flow in your space, the dust should collect neatly in one spot. The ozone output is very low. It looks great, and has a unique strategy of pushing air up to the ceiling and forcing existing air down and into the the suction of the filter. This is a benefit in that you can think less about where to put for the purposes of sending out ionized air, but you will ideally place it in the center of an open space. If you knew nothing about air purifiers, and you didn’t know the Coway name, owning this machine would make you confident in its craftsmanship. It has a CADR of 246 for dust, 240 for pollen, and 233 for smoke. This Coway air purifier isn’t the quietest machine available. That shouldn’t be a huge deterrent. You could do a lot worse given all of the Pros listed above! There’s a baby brother model that you should probably steer clear of also. For it’s price you can find a better alternative, although this model does include a noise machine. There is a third model, which is very similar to the Coway AP-1512HH Mighty model, but is skinnier, vents air form the side so needs to be placed strategically, has double filters (double replacement costs), and is slightly less powerful for nearly the same price. It has 4 filtration stages, it looks great and has some bells and whistles on it. If you buy a Coway air purifier, you can trust in the brand name. The customer reviews on Amazon are pretty overwhelmingly positive, and even the negative ones don’t seem so persuasive. Find out more about the Coway on Amazon.